An entrepreneurial project born out of the Vodafone World of Difference (WoD) programme is powering the growth of women on Rabi Island. In 2010, Terikano Takesau set on an ambitious task to change the lives of women in her community.Â WoD provided the platform for Takesau to realise her ambitions by supporting her for 18 months with financial and capacity building resources. Takesau started a virgin coconut oil (VCO) project by engaging the womenâ€™s group on the island.Â The women produced the oil at their locations and brought it to the Womenâ€™s Centre at Nuku for marketing and sales.Â Without proper production facility, the group was producing 20-50 litres. Late 2010 Tekasau secured $15,000 from the NZ Embassy to establish a service with electric coconut scrappers.Â In 2013 the Government of Fiji, through the Integrated Human Resources Development Program (IHRDP) approved a grant of $20,000 to establish a VCO factory.Â The factory officially opened in July 2015 providing opportunities for some 150 women.Â The Rabi Council of Leaders (charity partner for World of Difference program) also pitched in with a $13000 funding. 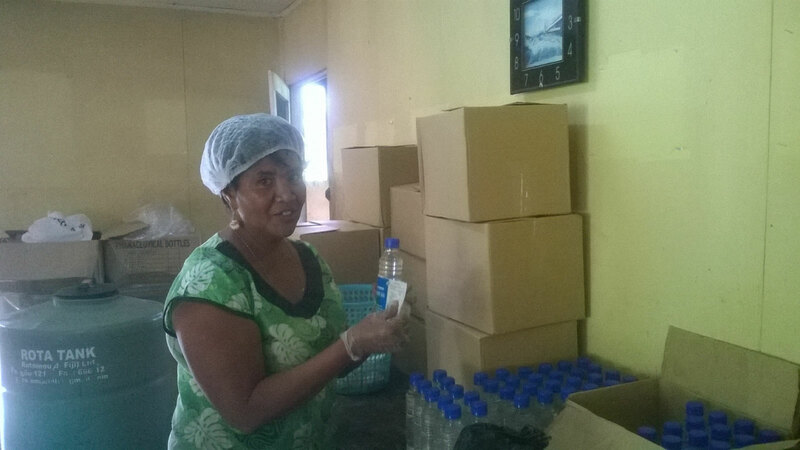 Today the factory has a monthly production of 600 litres of 1st Grade Pure Virgin Coconut Oil, 200 litres of Sinusinu 2nd grade oil, and 1 tonne of Coconut Dried Meal for animal feed.Â The women generate an annual revenue of over $60,000 with efforts in progress to enter new markets. Takesau said they hoped to provide more employment opportunities for school dropouts residing at Rabi and to enable Banaban women and the Banabans living on Rabi to have a brighter future. â€œThis as an opportunity for the women to make use of their talent, earn income for their families and we acknowledge the support of everyone who have made this a reality. The VCO factory has not only benefitted the women but the whole community as well as we are purchasing husked coconuts from them at 30 cents per kg. The women are also utilising the coconut shells to make handicrafts and accessories to generate income,â€ said Takesau. The project has turned into an established business. Work is in progress to extend the factory to increase production. The group is also working to develop a soap-making plant very soon.